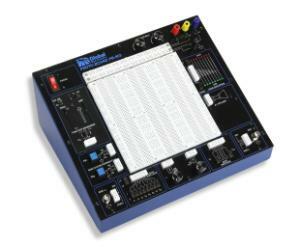 A time-tested workhorse designed for all levels of electronics instruction and prototyping. Students can create and implement their own circuits onto the breadboard, which is removable for multiple student usage in lab settings. For both series and parallel circuits, it can also handle much more sophisticated multi-stage microcomputer circuits. Multiple features in one complete test instrument can save hundreds of dollars necessary when purchasing individual units. Check out the user manual for a full list of specifications.